Braunschweiger is a liver based smoked sausage. The meat has a very soft, spread-like texture and a distinctive spicy liver-based flavor. 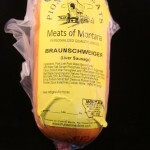 Brian’s favorite from the Pioneer Meats collection in Big Timber, Montana.